← The Fifth P – Packaging! By now, many male (and female) consumers are familiar with the popular viral video for Dollar Shave Club. The humorous video has more than 10 million hits and has helped the company build a subscriber base of roughly 200,000 men who receive a new shipment of razors each month from Dollar Shave Club. But how does an online company known for a single product line add to its success? It starts by examining the needs and wants of the target market. And, in the case of Dollar Shave Club, it sticks with a category and market it knows – personal hygiene and men. It’s a sizeable market to enter – toilet paper sales are $8.4 billion annually, which is a much larger category than the $3.6 billion annual market for razors and blades. However, for all it’s size, within the toilet paper industry, wet wipes are a niche product adopted mainly by women and children. 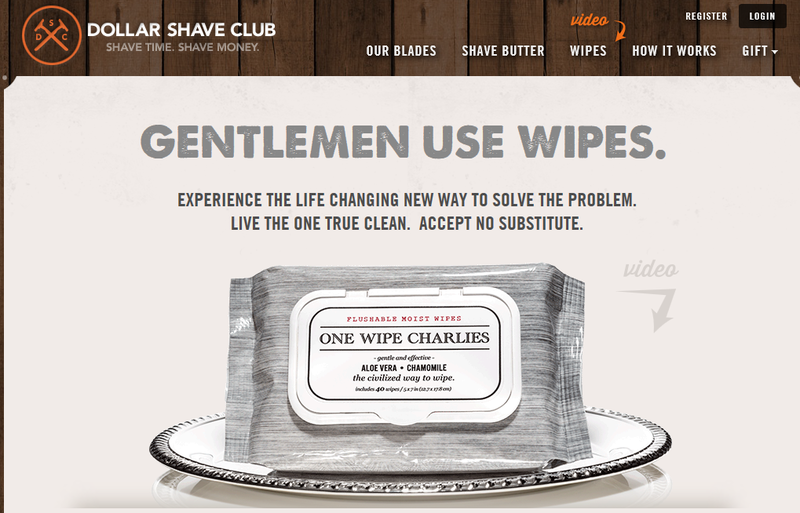 Enter Dollar Shave Club’s product, One Wipe Charlies. For a $4 monthly subscription addition, a package of 40 wipes can now be delivered – discretely – each month. Discuss the video: key message, target market, effectiveness, etc. Discuss the marketing strategy that the company uses. Using the product/market grid, discuss which strategy the company is using with the wet wipes. Divide students into teams. Have each team brainstorm on additional products that could be sold to the company’s customers.